Rho Cassiopeiae (Rho Cas) shown at the top of the page belongs to an unusual class of stars, a yellow hypergiant of which only seven have been found in the Milky Way. Despite being located some 10,000 light-years (ly) away, the star is visible to the naked eye because it is over 500,000 times more luminous than Sol. 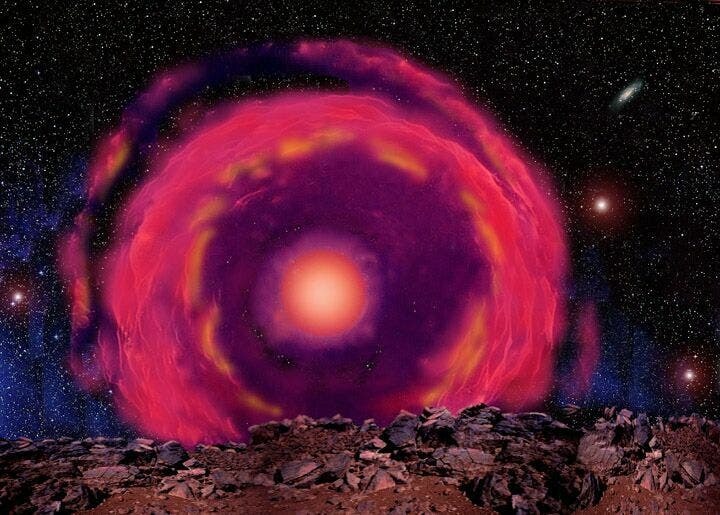 With surface temperatures between 3,500 and 7,000 °K, yellow hypergiants appear to be stars that are at a very evolved stage of their life and may be close to exploding as supernovae.